For like the 32nd consecutive year, the United Nations (UN) reports that the World’s fisheries are overexploited. But now, finally, we have someone to blame. Wealthy Asians. Beel says, come on. Captured fish are going to be sold. Beel is pretty sure of this. If Asians, or anyone else, have money to buy fish and demand exceeds supply, the price will increase: look at prices in your local markets over the past year. They have gone up. Asian money may be buying fish, but it is not putting fishers to sea. In fact, in many fisheries, fleet size is decreasing. Fish stocks are on the decline, fuel prices are increasing, and it is increasingly difficult to make a living at fishing. Don’t you love this picture, which came with one of these reports? 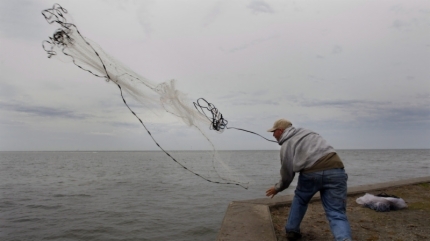 This guy, man against the ocean, with a cast net, tossing from a seawall, is bringing the oceanic fisheries to its knees. C’mon. It’s boats like this (above), which harvest tons of fish and “bycatch” on every haul, 24 hours a day, 7 days a week that are putting the hurt on fisheries. The little guy with a cast net can’t survive. Nor can the fish. So, what is up? Well, demand for fish is up, prices are up, but availabiliy is down. Beel is a biologist, but sees this as simple economics. So simple, in fact, that not even an economist could obscure it! But Beel does not ignore the impact of many small fishers, in certain inshore fisheries. Why doesn’t anyone step in? Why does overfishing still occur in USA waters? Why did the National Marine Fisheries Service (NMFS, part of the National Oceanic and Atmospheric Admistration) recently put in place catch limits for most USA coastal and marine fishes? They put the limits in place, because USA fisheries are in decline. Because fishers want to catch fish, and more fish. When NMFS tries to be responsible, fishers look to use political pressure to have responsible administators, such as Jane Lubchenco, fired. In her tenure, Lubchenco has arguably done more to involve fishers, particularly recreational fishers, in decision making than any of her precessors. But, back to the UN. Every year, it seems, they report more gloomy news. Fisheries are overexploited. Fisheries are overexploited. Beel suspects that people get desensitized to this message. Let Beel present results of a Google Insights for Search analysis of queries for overfishing. Clearly, there is a longterm trend for decreasing search volume. Interest in overfishing is decreasing. Sure, people have other interests, but Beel has to wonder whether the persistent discussion of overexploitation isn’t desensitizing the public. Beel asks, what do you think? With the reports by the UN bringing attention to the rapid decrease in fish populations one would think that countries would create some form of protocol to protect at risk populations. However many countries fail to recognize the facts and continue to over exploit populations. 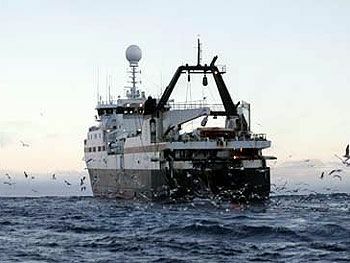 The studies done by the UN are sure to catch attention but I believe the industry of commercial fishing brings a large amount of economic incentive to too many countries for them to reduce fishing fleets. If countries continue to ignore the research and statistical models fisheries will continue to decline. The question I ask is when will enough be enough? I feel that there will have to be some sort of large implication to due aquatic biodiversity loss before governments take proper action. The public will have to become engaged if there is to be any hope. Look at shark finning, for example. There was little concern for this practice until the 1980s, then the popular literature (and media exposure) grew rapidly, sensitizing people to the issue in recent years. Now, country after country is banning the practice. There was the same kind of response to dolphins and purse-seining for tuna 15-20 years ago- once the public became engaged, there was change. Unfortunately, the public really doesn’t respond well to broad themes- prevention of overharvest, for example- so much as to specific cases. So, when will enough be enough? When the public feels it and responds. Overfishing is a really tough nut. For at least two reasons, one of which you point out: there are considerable economic interests involved, large companies and lots of fishers. Everyone sees this, the public, politicians, etc. The second reason is that not all stocks are over fished. For example, Atlantic cod, off the northeast US coast was essentially fished to economic extinction. This was the source of the fish in fish sticks that Beel grew up on. Now, Alaskan pollock- a related, but smaller fish- is used in fish sticks and simlar products. But that fishery is being managed much better and, at present, appears to be sustainable. So, overfishing is not universal. This is really hard to get across, increasingly people are trained to see things as either black or white. The public needs to become better informed about the status of individual fishes and fisheries, not just “fisheries” as a whole. There have been some attempts to do this. We’ll get there. In the meantime, have no doubt about this, policy makers will take advantage of the confusion. Beel has started reading a short book by Ray Hilborn (Overfishing: What Everyone Needs to Know) that may get at some of this. Ray is a very widely-respected fishery scientist. Beel has read some of Hilborn’s writing on the subject of overfishing and is not yet sure what to make of it. Your message will stimulate Beel to start the book anew. Beel will report back. When will enough be enough? In the end, when enough people become angry and vocal enough about this, there will be change. Look at the Arab Spring, this past year. 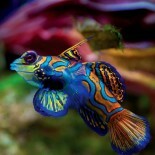 This entry was posted on January 25, 2012 by denstormer in Commentary, Fishing and angling, Google Stuff and tagged Google Insights for Search, overexploitation, queryomics, USA.